Our people are an essential part of our success. As a family-owned company, caring for our employees, and celebrating our success with them, is of the highest importance. These values are deeply rooted within our brand and have remained consistent since the founding of Chopard by Karl Scheufele I. We are proud to see our employee fidelity rate rising every year. This loyalty is an undeniable illustration of the positive work environment and family spirit we strive to transmit to all our staff members. We value and encourage diversity and gender equality within and are committed to providing an environment supportive of empowerment and equality of opportunity for all of our employees. Chopard is proud to observe two rare phenomena in todays’ working world – generations of our artisans passing their expertise to their children to continue their family relationship with Chopard, as well as employees who celebrate 20 and more years of loyal service. Workplace well-being as well as health & safety at work programs not only have a positive impact on your employees’ wellness, they also lead to a significant increase in our team’s engagement, cohesiveness and overall ambiance. 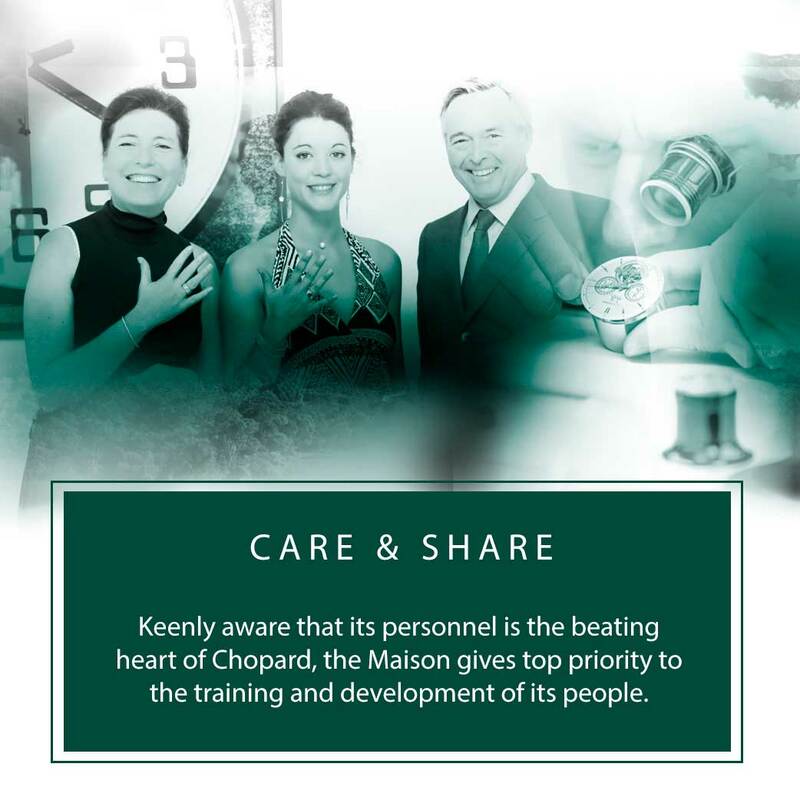 Chopard tackles emotional and mental health, social connectivity, positive attitude and many other themes through a number of “Work-life balance” initiatives developed specifically for our personnel. Keenly aware that our personnel are the beating heart of our Maison, we give top priority to the training and development of our people. Continuously evolving technological, regulatory, environmental and other external factors require that employees constantly appraise their skills and capacities. 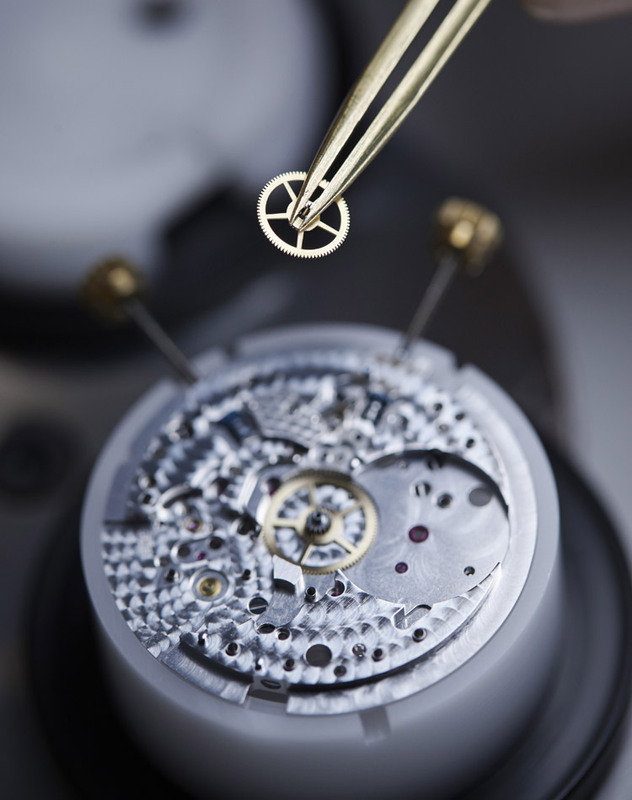 Chopard trains its staff in numerous operational, managerial, health & safety at work and other fields, as well as in a number of “Métiers ‘d'Art” specialities directed to the staff members working within the watchmaking and jewellery workshops and sharing their knowledge between different generations. Due to the nature of the rare savoir-faire and traditions associated to our expertise, these on-job trainings very often constitute the only source of knowledge enhancement. In December 2013, Chopard inaugurated a new production facility - Fleurier Ebauches SA. This industrial facility produces mechanical movements that equip Chopard watches. 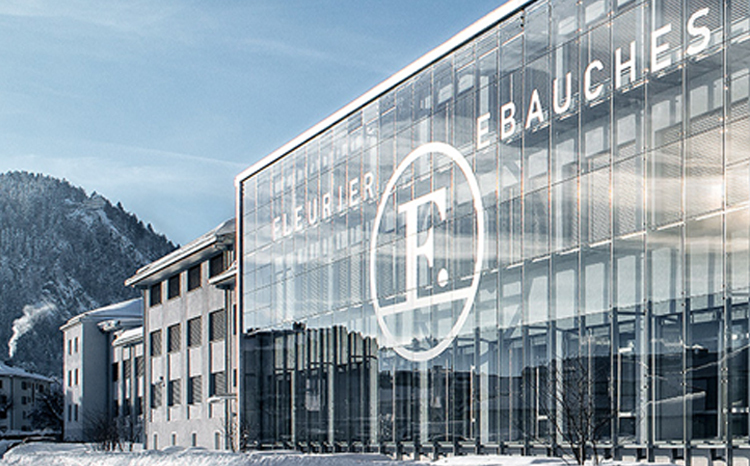 Fleurier Ebauches is also home to a training centre that, specifically designed for our employees across the world, provides watchmaking courses that allow us to provide impeccable service worldwide. The Scheufele family has always paid great attention to supporting the watch and jewellery-making traditions and, thus, to training future generations. Consistent with the brand’s values and in a willingness to safeguard and pass on our know-how, the company created the first jewellery-training unit in 1980 in Meyrin. This was followed by variety of different units, such as a dedicated watchmaking school in Fleurier. 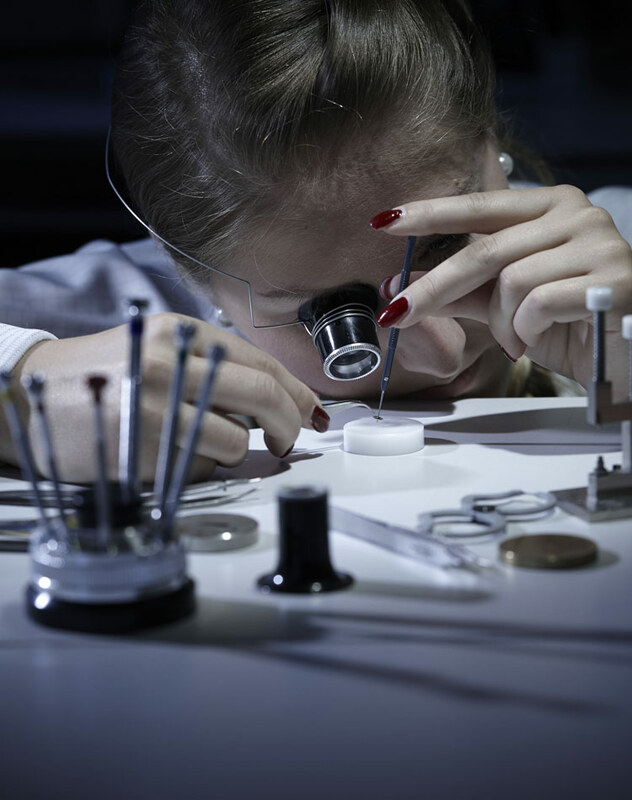 Chopard opts for highly comprehensive apprenticeship programmes, that preserve watch and jewellery professional skills. Each year, we recruit about 10 new apprentices. These young adults are supervised by an apprenticeship master who follows them throughout their four-year course. 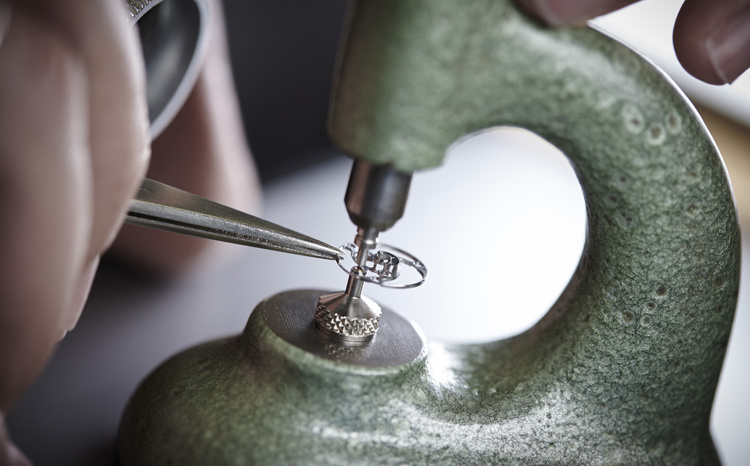 Each year the Maison trains about 40 apprentices in the following fields: jewellery, watchmaking, polymechanical, micromechanical and surface finishing. The State of Geneva recognized our efforts though granting us the “Best Training Company Prize” in the “Applied Arts” category. Further, two of our apprentices were recently rewarded by the State of Geneva for the best apprenticeship in jewellery and watchmaking. Chopard, the big-hearted Maison, has always regarded self-giving and generosity as its core values. As a family firm passed on from generation to generation, it does not restrict itself to selling exceptional watches and jewelry, but also dedicates the family-driven success and influence to philanthropic commitments. The Maison provides unconditional support for several charitable associations through special editions of its iconic creations. Since 2009, Chopard has been joining forces with friend of the Maison Petra Nemcova, whom the foundation helps to rebuild safe, resilient schools in areas impacted by natural disasters. To support All Hands and Hearts - Smart Response, Caroline Scheufele has created a special edition 18ct-rose gold bangle from the Happy Hearts Collection, featuring a red heart as well as a heart with a dancing diamond. Part of the proceeds are dedicated to supporting the charity. Finally, Chopard supports the Education Above All Foundation through specially created Happy Hearts bangles. Picking up the aesthetic codes of dancing diamonds, these bracelets in 18-carat rose or white gold feature a heart enclosing a dancing diamond and a circle with an “Educate a Child” charm, facing each other in an elegant “pas de deux”. The Foundation, set up in 2012 by Her Highness Sheikha Moza bint Nasser, aims to sustainably improve human, social and economic conditions worldwide through education. For its cooperative endeavour with the charity, Chopard has specifically chosen to back the “Educate a Child” programme aiming to facilitate access to schooling for children in geographical areas where it is most threatened by poverty, environmental factors, cultural barriers or conflicts. Looking firmly to the future and to those who will build tomorrow’s world, this programme wagers on the benefits in terms of progress and prosperity that children’s education can provide. To help fund programmes that benefit The Naked Heart Foundation, Chopard has also crafted a special edition of the Happy Hearts bangle adorned with a pink mother-of-pearl heart, from which a percentage of all sales proceeds goes to the organisation dedicated to helping children with special needs. Set up in 2004 by supermodel and philanthropist Natalia Vodianova, the charity’s main mission is to help build an inclusive society that is open to people with disabilities and special needs, through encouraging play and creation of free support services for affected families. The foundation supports a range of smaller Russian NGOs focused on children with special needs, as well as running family support centres, training teachers of special schools and nurseries to use modern technologies for working with children with autism, along with organising integrative summer camps for children with special needs and their parents. 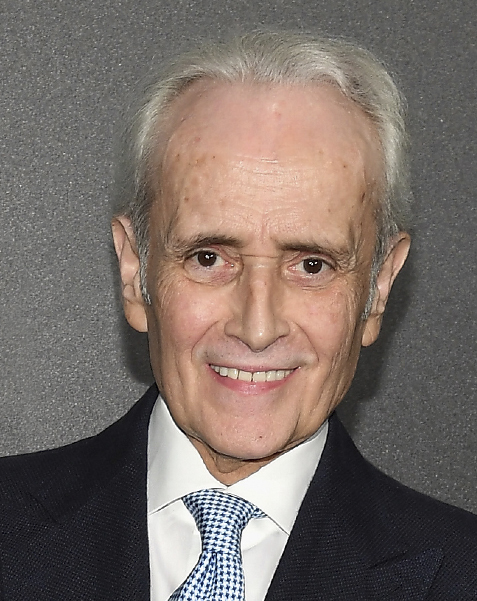 In July 1988, one year after winning his battle against leukaemia, the world-famous tenor José Carreras set up a foundation to support research and promising scientific projects. The Foundation also helps to improve treatment opportunities and increase the number of hospital units that are equipped to perform bone marrow transplants. José Carreras and the Scheufele family are united by a longstanding friendship. In 1991, they helped to create the foundation of the Swiss based Geneva entity and then, in 1995, a unit in Munich. Since then, Mr. Karl Scheufele has become the President of the Swiss Foundation. 1996 was the launch year of the José Carreras watch collection. The first limited editions bore engravings of various opera houses around the world on the case-back. This partnership continues through sales of earmarked L.U.C XP watches.